Next up, Purdue. Boiled Sports agreed to answer some questions about the Boilermakers upcoming season, Robbie Hummel, and whether a rivalry is brewing between Michigan and Purdue. Football season hasn’t been to kind to the guys over at Boiled Sports so they were glad to lend a helping hand. On an unrelated note, be sure to check out the live chat with DeShawn Sims today at 1PM on MGoBlue.com. Last year’s Purdue team won the Big Ten tournament and made the second weekend of the NCAA tournament but you just get the feeling that Robbie Hummel’s back kept Purdue from reaching their ceiling. What are your expectations for the Boilers this year? A lot more than just skill seems to go into a team making the final four…and as Purdue fans, we don’t really think ourselves as lucky. But, another step forward for this talented bunch is expected by us as we see Purdue going to the round of eight in March. Robbie Hummel has put together a tremendous career thus far, but how good can he be? To me, Hummel’s game is a lot like many of the European players that have had great success in the college ranks and in the pros. Like them, he thinks the game very well, never stops moving and can shoot- in fact, it seems even his bad shots almost go down because he always seems to square his shoulders regardless of his balance. He doesn’t jump particularly well, but he’s in the right place at the right time so often because of his understanding of the game. If he stays healthy all season, we think he’ll be an All-American. Much of the media loves him, that never hurts…and he’s surrounded by players who compliment him well…also helpful. JaJuan Johnson is a budding star who stepped up last year and is easily one of the best big men in the conference. 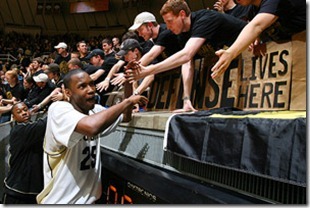 How will Purdue utilize Johnson and what kind of season should we expect from him? I don’t know if we expect the same rate of growth as we saw between his Frosh and Soph season, but everybody who watches Purdue is expecting big things. Supposedly, getting cut from the University Games team lit a fire under him. That could be bad news for the rest of the league. Hopefully it motivated him to pack on a few pounds. I expect a lot of fast break finishes from JJ this season- he and Lewis Jackson really clicked during portions of last season and I think with a season under their belts as team mates, they’ll understand each other even better. His ability to block shots was incredible last year as well, and that’s not going to slow down as his technique and timing are amazing on defense…ref. the Washington game in the tournament. He really needs to work on his consistency and will rebounding the ball though- that was a big problem in stretches last year. Any notable graduations or departures? Purdue lost some fan favorites in the form of Reid & Riddell and a few solid role players in Green and Calasan. That said, the core is very in tact and the sum of the parts of the incoming class might be stronger than these four, from the very first contest. Who are the notable incoming recruits? Anyone that can make an impact as a freshman? We really like DJ Byrd a lot. From the time he verballed two years ago, he’s been a Purdue guy. Plus, he’s a gritty player who can shoot. In high school, he was a tough defender and offensively, he created his own opportunities well. I think we might not see a ton of offense from him, but defensively, he could be a good reliever for Kramer. Bade should give the frontcourt some needed depth. E’Twaun Moore seemed to take a pretty significant step back last year (eFG% down 5%) is there hope that he will be back to his freshman year form? We think he will. Consistency was his biggest problem last season as he’d disappear for halves at a time, but you can be sure that he’ll shoot his way out of last season’s woes…like most shooters, he has little conscience. 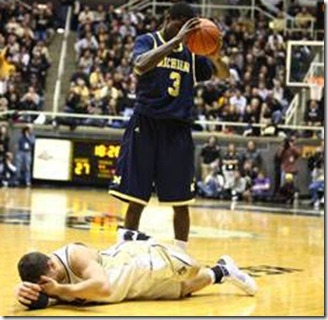 Last year’s Michigan/Purdue series had the grounds to start a bit of a rivalry with a close game interrupted up by Manny Harris’ ejection followed by a huge win for Michigan in Ann Arbor. Michigan and Purdue only play once this year (in West Lafayette) do you think both teams place a little extra emphasis on this one? Judging by Purdue’s game in AA, the team might be placing less emphasis on this game…I’m kidding of course; that loss was an awful showing for Purdue, but UM played inspired. I think one thing will be for sure- Mackey Arena will remember Manny Harris…whether or not Painter places more emphasis on it or not remains to be seen. I think what happens right before this game might decide the intensity of the contest more than anything. Evan Turner creates nearly-impossible match-ups due to his combination of skill and length…when he’s inspired, he can score on anyone. If the question was most-hated, I think Kramer would win hands-down…I think he likes it that way. We’ve been looking forward to basketball season since March…this fall hasn’t helped our lust for roundball. Only 20 days until the first exhibition game…Thank God! !